A big part of the reason I have posted less than I imagined is due to the all consuming event that is the craft fair I am organising. I have never done/ sold at a craft fair and here I am organising one! I belong to a few different craft groups and mentioned to them that I'd like to do one but I was nervous of the approx £50 stall price. They agreed so we thought it would be good to do a beginners one and here I am 6 weeks on and it's going to happen on Saturday. 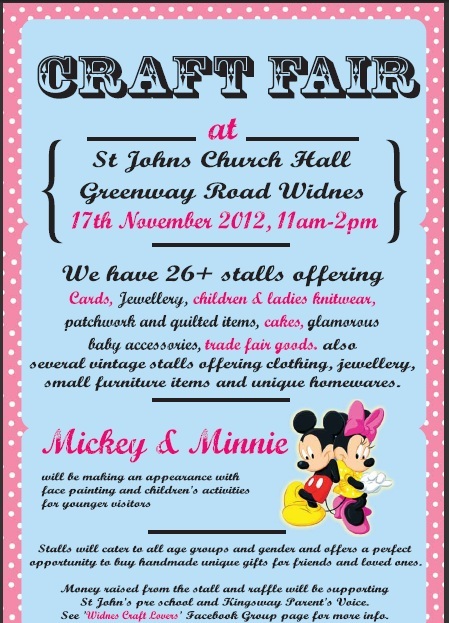 So from the advertising through putting up posters around our town and Social Networking, we have 29 stalls- YAY! It hasn't been without hiccups with people dropping out and not having enough tables- other events on the same day and even a bigger and better more professional) fair scheduled for the next day. I am not concentrating on this now, but focusing on how on earth I am going to get enough stock finished before Saturday!